Weak cross reactivity is observed with mono methyl K27 Histone H3. No cross-reactivity is seen with di or tri methyl K27. Synthetic peptide within Human Histone H3 aa 1-100 (mono methyl K9) conjugated to Keyhole Limpet Haemocyanin (KLH). The exact sequence is proprietary. Our Abpromise guarantee covers the use of ab9045 in the following tested applications. WB 1/1000. Detects a band of approximately 15 kDa (predicted molecular weight: 17 kDa). Can be blocked with Histone H3 peptide - mono methyl K9 (ab1771). ChIP Use 4-5µg for 106 cells. Chromatin was prepared from U2OS cells according to the Abcam X-ChIP protocol. Cells were fixed with formaldehyde for 10 min. The ChIP was performed with 25 µg of chromatin, 2 µg of ab9045 (blue), and 20 µl of protein A/G sepharose beads. No antibody was added to the beads control (yellow). The immunoprecipitated DNA was quantified by real time PCR (Taqman approach for active and inactive loci, Sybr green approach for heterochromatic loci). Primers and probes are located in the first kb of the transcribed region. Anti-mono methyl lysine 9 of histone H3 (green) has a distribution often associated with euchromatic probes (small foci). Most of these foci localize to regions that contain obvious enrichments of DNA with DAPI staining (red). The perinucleolar chromatin is typically a site enriched in monomethylated lysine 9. Top left: Mono-methyl Lys 9 (ab9045); Bottom left: DAPI; Top right: Merge of ab9045 (green) and DAPI (red). ab9045 staining rat liver tissue sections by IHC-P. Sections were formaldehyde fixed and subjected to heat mediated antigen retrieval in citrate buffer pH 6.0 prior to blocking with 5% serum for 30 minutes at 20°C. The primary antibody was diluted 1/400 and incubated with the sample for 45 minutes at 20°C. 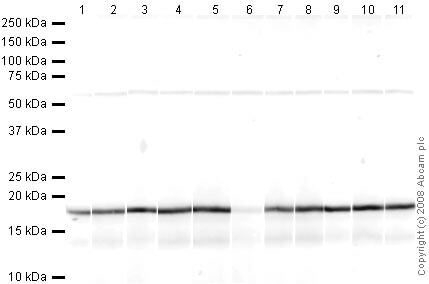 A HRP-conjugated goat anti-rabbit antibody was used as the secondary. This antibody shows significantly greater reactivity with mono methyl K9. This can be seen in lane 7, as the addition of ab1771 (mono methyl K9) completely blocks the activity of ab9045. Weaker cross-reactivity is seen against mono methyl K27. This is shown in lane 3, as the addition of ab1780 only partially blocks the activity of ab9045. Lysates/proteins at 0.5 µg per lane. 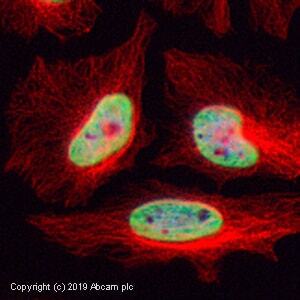 ab9045 staining Histone H3 (mono methyl K9) in HeLa cells. The cells were fixed with 4% paraformaldehyde (10 min), permeabilized with 0.1% Triton X-100 for 5 minutes and then blocked with 1% BSA/10% normal goat serum/0.3M glycine in 0.1% PBS-Tween for 1h. The cells were then incubated overnight at +4°C with ab9045 at 1ugml then detected with an Alexa Fluor® 488 goat anti-rabbit secondary antibody (ab150081) at a 1/1000 dilution (shown in green). Nuclear DNA was labelled with DAPI (shown in blue), and ab195889, Mouse monoclonal to alpha Tubulin (Alexa Fluor® 594), at a 1/250 dilution (shown in red). Histone H3 (mono methyl K9) was immunoprecipitated using 0.5mg Hela whole cell extract, 5µg of Rabbit polyclonal to Histone H3 (mono methyl K9) and 50µl of protein G magnetic beads (+). No antibody was added to the control (-). Proteins were eluted by addition of 40µl SDS loading buffer and incubated for 10min at 70oC; 10µl of each sample was separated on a SDS PAGE gel, transferred to a nitrocellulose membrane, blocked with 5% BSA and probed with ab9045. Secondary: Anti-rabbit IgG VeriBlot for IP secondary antibody (HRP) (ab131366) at 1/1000 dilution. Band: 17kDa: Histone H3 (mono methyl K9). Publishing research using ab9045? Please let us know so that we can cite the reference in this datasheet. Customer inquiry regarding anti-histone H3 antibodies. Study is investigating methylation status of Histone H3, specifically on Lysine 9 (K9). Products I am already considering are ab70550 (anti-histone H3), ab1220 (anti-histone H3 di methyl K9), ab8898 (anti-histone H3 tri methyl K9), ab3790 (anti-KMT8/Riz1/Riz2). What protocol do you recommend in regards to preparing a cell lysate for detecting histone H3 via western blot? What is the minimum amount of cells that should be used? Why would one investigate these antibodies together in one study? Below I have summarized our conversation and answers to your questions. The Histone Extraction Kit can be used to extract histones from as low as 1 million cells or 1 mg of tissue as stated on the datasheet. These lower limits are good guidelines for the Nuclear Extraction Kit as well. Do you know if this Ab will work in IP or ChIP? To our knowledge, this antibody has yet to be tested in this application. All tested applications are specified on Abcam product datasheets. If you decide to go ahead and purchase this product, please let us know how you get on and in return we will forward a reward of your choice, typically an Amazon gift voucher.